신명곤, 이규희,(2010).짠맛 대체용 향신료조합물의 관능특성 및 항산화 특성.한국식품영양과학회지,39(3),428-434. 소금의 짠맛을 대체하기 위한 조미료를 개발하기 위해 잘 알려진 18가지의 향신료에 대한 맛을 정량묘사 분석하여 9개의 용어를 도출하였고, 맛 특성과 18가지 향신료를 주성분 분석을 이용하여 새로운 변수 PC1과 PC2에 대하여 상관성을 분석하였다. 주성분 분석결과 구수한 맛, 감칠맛과 짠맛 그리고 신맛과 매운맛 특성을 갖는 각각의 향신료 그룹을 결정할 수 있었고 이들 각각의 특성을 중심으로 네 가지의 소금 대체용 향신료를 제조하여 소금의 다량 섭취가 우려되는 간고등어 대신 향신료 조합물을 뿌렸을 때 기호도를 조사한 결과 신맛과 매운 맛 특성을 갖는 향신료 조합물의 기호도가 유의차를 나타내며 우수함을 알 수 있었다. 또한 이들 향신료 조합물에 대한 항산화성을 조사한 결과 매운맛과 신맛 특성을 갖는 향신료 조합물의 항산화력이 가장 높은 것으로 나타났다. 따라서 매운맛과 신맛을 특성으로 하는 향신료 조합물은 기호성과 항산화성이 증진 된 천연 소금대체용 향신료 조합물로 사용할 수 있음을 알 수 있었다. 본 실험에서는 관능평가를 이용하여 조합물을 개발하여 소금대체용 향신료의 개발이 가능함을 확인하였고 향후 이 향신료조합물의 화학적 및 임상적 특성에 대한 분석이 필요하다. The spice combinations for substitute of salty taste were developed for reducing sodium intakes in home cooking. The seventeen materials, which have been known as remedy effects for hypertension, were collected and blended based on descriptive sensory evaluation and principal component analysis. Four types of spice combinations such as nutty, umami and salty, hot and sour, and multi attribute were developed as substitutes of salty taste. The developed spice combinations were applied to mackerel meat instead of salt. 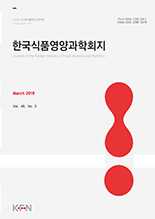 Consumer acceptance of mackerel meat with spice combinations was analyzed using hedonic nine point scale by 54 panelists. As the sensory evaluation results, the consumer acceptance value of the spice combinations for substitute of salty taste with hot and sour attribute was the highest value as 6.4, whereas that of the salt was 3.1. Also, the fish and rancid flavor were the lower values in the salt free spice blends than those of salt. The spice combinations for substitute of salty taste 5% and NaCl 1%, as a control, were spread on mackerel meat and incubated at 30oC for 0, 24, and 48 hours. The TBA values of the spice combinations for substitute of salty taste were shown as a half and/or one third values of salt. As the result, the spice combinations for substitute of salty taste with reducing undesirable flavor could be used in home cooking instead of salt.